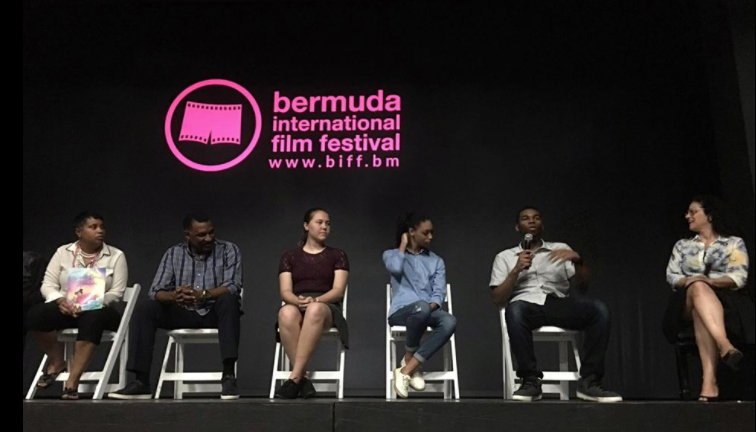 It’s a wrap for the Bermuda International Film Festival [BIFF], which showcased a new initiative this year for one of the final sessions, featuring a new platform for Bermudian filmmakers, with an aim to encourage development of the Bermudian film industry. Several hundred people were at BIFF on a sunny Sunday afternoon on May 7th to see a line-up of Bermudian films and to hear a discussion amongst the filmmakers, which included CITV senior producer Robert Zuill explaining to the Bermudian filmmakers that CITV is seeking content for Bermudian programming. Sunday had started with a duo of America’s Cup films, introduced by TeamBDA Committee Chair Peter Durhager. Their films interviewed members of the Red Bull Youth team. This was followed by ‘Kasso’ a scenic documentary by Emma Outerridge, the wife of the captain of Artemis. 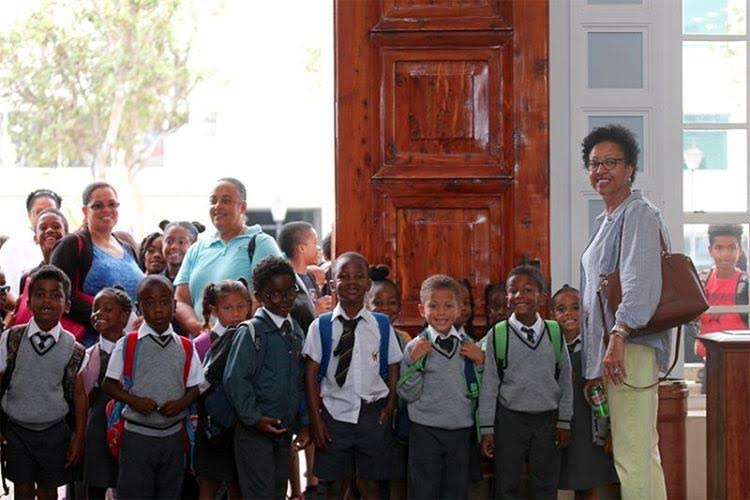 She galvanized people in Bermuda to come together to buy a bus for a school in Uganda where Outteridge had been a volunteer. She held a Q&A after the film. The America’s Cup Set flowed directly into the BerMovies as previously mentioned. These films were free to everyone. During the week, there were special free programmes for school children as well. Over 800 children participated in The BIFF Academy. For Primary Students, there was the ‘Books to Film’ series read by BIFF’s Marietta McCoy and Tashel Bean. It included ‘Abigail’s Dream Adventure’ a book and film by Bermudian author Karen Franks. ‘Reel Talk’ was a morning for older students that featured a handful of topical material from short films submitted to BIFF for Oscar consideration. An impact conversation was led by former Premier and Minister of Education Dame Jennifer Smith. The 20th Edition of the Bermuda International Film Festival opened on Monday, May 1st in City Hall with a retrospective about the last two decades. The BIFF produced short film featured interviews from people involved in the BIFF early years. It was produced by Event Manager and Local Artistic Director Nicky Gurret along with guest Juror Natalie Gee. Before each BIFF film, there was a short clip showing the posters from the last 20 years. Juror and composer Simon Taufique composed the catchy music. Twelve feature films selected by Guest Artistic Director Nick Roddick were screened over the seven days. It started with a World Premiere of ‘My Letter to the World’, a documentary about Emily Dickenson. Director Sol Papadopoulos and Executive Producer Andrea Gibson were in attendance. The duo also created ‘A Quiet Passion’ next on the schedule, which had only been shown in LA prior. The official closing film was greeted with reels of laughter. ‘The Hippopotamus’ is a parody on TV comedian Stephen Fry in the visual splendor of a picture book English Country Home. The best attended film was mid-festival, with the Swedish film ‘A Man called Ove’. The last feature film was on BerMovie Day. 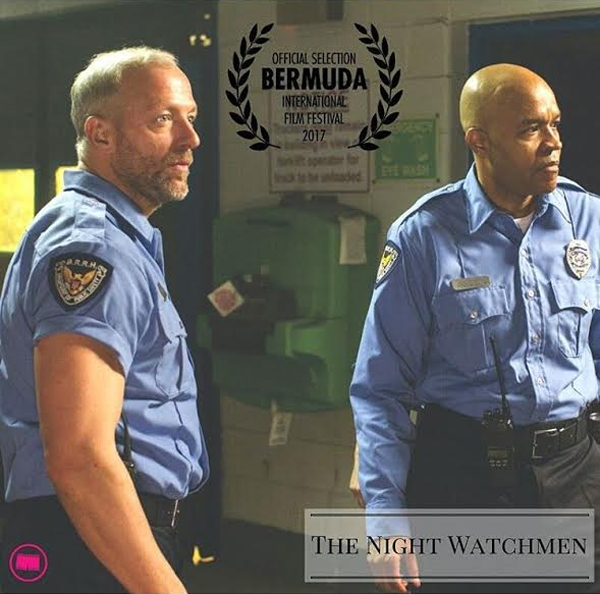 ‘The Night Watchmen’ [TNW] is a campy fright-flick by a Bermudian company. Executive Cheryl Staurulakis and Producer Allard Jeffrey made it a party, with the wrap reception in the City Hall Lobby. TNW production team is planning to film a dramatic feature in Bermuda this Fall. Another party event was the Friday Late Night World Premier by Bermudian film company TriVenture Films. ‘By Any Means’ was viewed by an enthusiast audience including Bermudian resident lead actress and producer Brooke Burfitt Williams. Bermudian Lucinda Spurling and Brooke Williams are co-producing Babymoon that was filmed here in February. They shared the trailer of their film which will be released under another name this winter. At the heart of BIFF is the Bermuda Short Film Competition. The recipient of the competition that will qualify for consideration in the Short Film – Live Action Category of the Annual Academy Awards ®, provided the film otherwise complies with Academy’s rules. The choice was announced at the BIFF Awards Ceremony and Closing Reception on Saturday Night in the Bermuda National Gallery by Juror Chair Jon Gann. The winning film was the favorite of both the jury and the people’s choice. ‘Watu Wote-All of Us’ is a film about a dangerous border between Kenya and Somalia. Therein, a Christian family was shielded by her Muslim fellow travelers. The trailer is here. This movie was an impressively produced student programme directed by German Katja Benrath. Her acceptance video is posted on www.biff.bm. The film is based on a true story. Her short will be amongst a short list considered toward an Oscar ® by the Academy of Motion Picture Arts and Sciences ® early next year. The timing and format of next year’s BIFF will be decided in the coming weeks by the Bermuda International Film Festivals Purpose Trust Board of Trustees, and BIFF said they also considering a Shorts Film Weekend sometime this summer.